Whether you want a luxurious hotel for your vacation stay, or a vacation package offering economical dwellings for you and your family to reside in for the holidays, you’ll find the exact type of accommodation and travel package you need at HotelCluster. Dynamically search for popular tourist destinations and vacation spots the world over, and choose your favorite hotel and check its availability online. Find trustworthy reviews and articles of hotels, motels, bed and breakfast, inns, restaurants, tourist attractions and much more which can help you make your vacation more eventful and enjoyable. Share your opinions and experiences with other travelers and find how they feel and what they have to say about a popular tourist attraction. Find cheap airfare and discount packages, and benefit from up-to-date information provided by our guidebook. 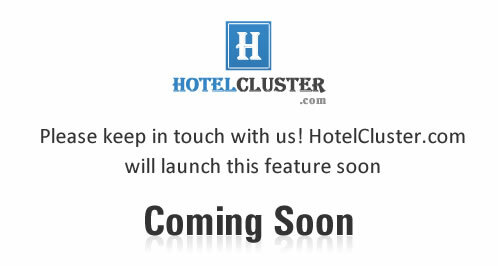 Register now with HotelCluster and advertise your hotels, vacation homes and travel packages online to millions worldwide to benefit from full bookings all the year round. Organize and plan your trip! Highlight the amenities offered at your property - Beat your competition! We’ll keep you up to date with our stuff.